Request a Commercial Vehicle Demonstration at your home or office! 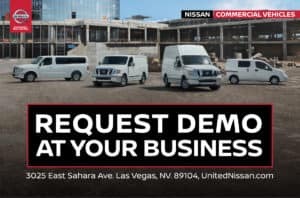 United Nissan realizes that as business owners and decision makers, it isn’t easy to take time out of your busy day to demo a new work vehicle. That’s why United Commercial Vehicle Center offers offsite demos. We will come to you, at a time that works with your schedule. Upon arrival, we will answer any questions you have, as well as allow you to fully test drive the vehicle. Simply fill out the form below, or give us a call at (702) 267-6058, and our dedicated commercial vehicle account manager will walk you through this simple and convenient process. Not sure what commercial vehicle you would like to demo. Don’t sweat it – just let our account manager know your line of work and he will bring out a vehicle that fits your specific needs.